Over/Under: Under 167.0 at 1.90 Bet Now! 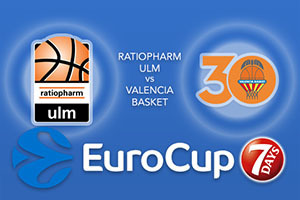 Both teams carry a 3-1 record going into this game and they have met on Eurocup duty a few times. The most recent clash obviously came in the first week of this season and the Spanish side won that clash and hold a 4-1 record in these games. The opening round of the season saw Valencia win 95-58 which was a rather convincing victory. Of course, while some teams would have crumbled after this size of loss, Ulm have rebounded strongly and have won every Eurocup game they have played since then. This includes a stunning 26 point victory over Hapoel Yahav Bank Jerusalem, who held an unbeaten record in the build-up to that game. Two players who have had a huge impact on the German side are Chris Babb, who has served up an average of 13.8 points per game and Raymar Morgan, who has managed to provide an average of 13 points per game. There has also been a double figure from Per Guenther, who has managed to average 10 points per game so far this season. These players are big factors in the success of Ulm so far this season in Group D.
Valencia lost out in their third game of the Group D season so they would have been delighted to get back on track in their last outing. It wasn’t all good news though because they lost Bojan Dubljeciv through injury. Until this point, the player had been the Spaniards’ top scorer, providing an average 12 points per game. Other players that need to step up and fill the shortfall are Rafa Martinez, who provides an average of 10.5 points a game and Fernando Sam Emeterio, who has offered up an average of 9.5 points per game this campaign. It does look like it will be difficult to separate these teams but the Spaniards do look in the mood to defeat the Germans once again. With this in mind, take Valencia Basket at -2.5, which is provided at odds of 1.90. If you want to enjoy the Over/Under market in this clash, look to go UNDER 167.0 which is available at odds of 1.90. Bet Now!